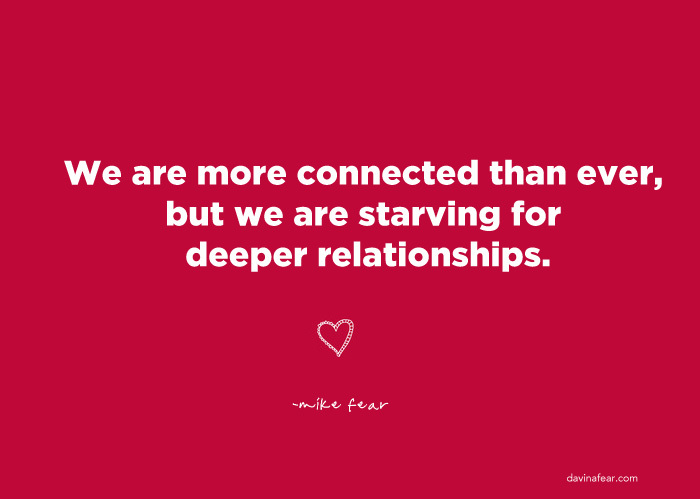 5 Recommendations for Creating Deep Connections - Something New Everyday! You need other people. Not because you're a needy little wimp, but because humans evolved as pack animals. We lived for thousands of years in tribes. Small tight knit communities of less than 150 people all working together to hunt wildebeests and fight off tigers. Everybody you'd ever know, marry, have babies, and get into fights with were part of that 150 people. While it may have been a bit claustrophobic for some, it did prime us to need deep and meaningful connections. Now this is the part where normally I, as the insightful and witty author, talk about how the modern world has ruined connection and tell you about Facebook damaging the word "friend" that it's all but meaningless. But instead let's just skip all that and talk about how you can build tribe level connections with people in your life. Most of us talk on a surface level most of the time, and that's fine for people with whom you don't want to connect. But if you want to create real connections you have to say something real. This means you have to be honest. With yourself and with the other person. Being honest doesn't mean being a jerk, but it does me showing up and saying what's actually going on with you and the world you live in. 2. Ask good questions and then actually listen. Learn to ask really good open ended questions and then listen closely to the answers. Don't just wait for your turn to talk. Take the time to really listen to what someone is saying. Take the time to reflect it back, to be clear on who this person is and what they care about. Become a master at asking and listening and you will create powerful connections with those around you. 3. Spend extended periods of time with people. We tend to interact with people in 10 – 30 minute chunks and that really isn't enough time to get to know someone. Instead make plans for a long slow hang*. When I say long and slow that's what I mean. Shoot for spending 2 – 4 hours or more of relatively unstructured time with someone. If you do this you'll get to experience much more of who someone really is. You'll begin to relax in their presence and that's when the walls start to come down. 4. Do stuff for people. Always be asking the question, "How can I help or how can I be of service?" Not directly but to yourself. Asking someone how to help them is nice, but it's hard to answer. Instead, if you notice a way to help, either just do it or offer it to them. Ask yourself, What would I like in this situation? What would help me if I was in there shoes? and offer to do that. Deep connections are built on service. Not on horse trading. The big key to deep connection is stepping into vulnerability again and again. When you're vulnerable your connection ports are open, but when you're guarded they're not. So be open and vulnerable whenever possible. Share what you're scared of, what your hopes are, what you're struggling with, your faults of character. And also listen to your friend's problems and complaints without judgement or advice. Simply hear them, witness them, and hold them in your attention. This is scary, but it's also worth it. Step into vulnerability and your connections will deepen. *Thanks to Keith Ferrazzi's book Who's Got Your Back for the idea of the Long Slow Hang.